The boy genius has only just turned 33 and he is bidding to become by far and away the youngest coach to ever win the Super Bowl. He is precisely half the age of his counterpart, the grizzled mastermind Bill Belichick, and it will be fascinating to see youth collide with experience in the biggest game of the year. Belichick will be a model of stoic calm, whereas McVay will be a blaze of wild animation. That energy and passion could rub off on his team and inspire them to victory. McVay is also the master of designing innovative plays and making effective calls from the sideline. Like Belichick, he is a supreme student of the game and a mad scientist when it comes to devising new machinations that can disorientate his opponents. His play design is impeccable, he will have plenty of tricks up his sleeve for Super Bowl LIII and he could usher in a brave new era for the NFL with a symbolic win over the veteran Belichick on Sunday. Forget Tom Brady, the Rams will have the best player on the field at Super Bowl LIII. Donald boasted a league leading 20.5 sacks during the regular season, four more than anyone else, and he was crowned NFC Defensive Player of the Year. He wins the PFF Pass Rusher of the Year award every season, and he has the ability to make life hell for Brady on Sunday. 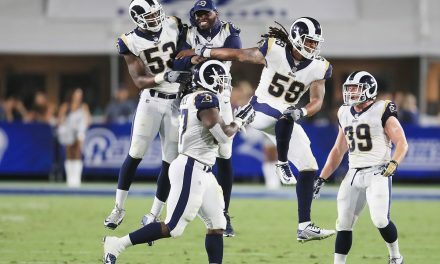 He lines up alongside Ndamukong Suh and Dante Fowler to form a terrifying defensive trio and they swarmed all over Drew Brees in the Rams’ controversial victory over the Saints in the conference championship game. Donald is the star of the show and he also led the league in tackles for loss, quarterback hits and quarterback pressures, making him the only player in the NFL to be unanimously named First-Team All-Pro. He is the single most destructive force in the game right now and that gives the Rams a magnificent chance of victory against the Pats. If you check out the Super Bowl markets at leading betting sites you will see that the Rams are the slight underdogs heading into this game. However, the underdogs have a 12-4-1 record against the spread since the turn of the millennium, showing that they often exceed expectations. The Eagles were 4.5-point dogs against the Pats last year, and they ended up securing a thumping victory. The handicap line is narrower this time around, and the Rams have more than enough quality to win this game outright. Many outside of New England dislike the Patriots, but they often bet on them due to their experience and the menace presented by the Belichick-Brady axis. Yet that can lead to an unrealistic skewering of the betting lines, and in most metrics the Rams really deserve to be favourites for this game. Jared Goff is no Brady, but quarterback whisperer McVay has made him into a strong offensive force. However, he will need a lot of help out there as the Rams are better when Goff is not called on to make too many passes. McVay pulled off a masterstroke in salvaging the veteran C.J. Anderson from the scrapheap and putting him alongside Todd Gurley to bolster the Rams’ running game and provide a greater offensive balance. Gurley and Anderson are full of explosive dynamism, and that should take the pressure off Goff and keep the Pats’ defense constantly guessing. Gurley should be back to full fitness by the day of the Super Bowl and he can cause all sorts of problems for New England. Player for player, it is hard to argue with the sentiment that the Rams have the superior roster. That is why they were favourites to win the Super Bowl throughout the regular season, with the Pats well down the list. Now that both teams have made it through to the big game, it is only the experience of Brady and Belichick that has made New England the favourite. Yet this Patriots team is by no means as complete or fearsome as the one that won the Super Bowl two years ago. Rob Gronkowski has gone off the boil, the run defense has a tendency to look flimsy and there are some creaking old limbs in this group. A younger, hungrier and more explosive Rams team can kill off a dynasty on Sunday. PreviousWhy Should You Purchase Memory Foam Mattress for Restful Sleep?